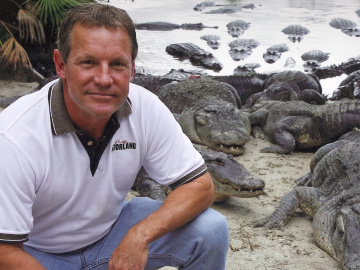 At the age of 36, Mark took over the reins at Gatorland and has since introduced over 50 new attractions and exhibits at Orlando’s only theme park with bite and attitude. His mission is to provide an entertaining, personalized experience for visitors through exciting shows and encounters with some of Florida’s most incredible animals. Before joining Gatorland, Mark served as animal trainer, researcher and spokesperson for Sea World. During his twelve years at several Sea World parks, he worked with 13 different species of marine mammals, including dolphins, sea lions, and killer whales.